Nails vs Screws: Which Is Better When Building a Shed? You’re all set to build your shed but what should you use to put it together? Even after completing several DIY projects I’m still confused about when is it best to use nails or screws and what size fastener is best? So, what is better for shed building, screws or nails? The quick answer is to use nails for framing and screws for finishing – sheathing and subfloor. Screws have the grip strength to keep plywood tight. But nails have the shear strength to keep structural members where they belong. I’ve gone through box stores and my local hardware stores, I’ve asked some pros, and surfed the net trying to find an answer. Do you know how many different sites there are about nails and screws? A lot more than I cared to look at! So I decided to put all the information in one place, so next time I’m unsure, I can come back to this guide and check. What is Better, Screws or Nails for Shed Building? What are the Main Differences between a Screw and a Nail? What Does the Letter “d” in Nail Sizes Mean? What Fasteners to Use in Different Parts of Shed Construction? What Type and Size of Fasteners to Use with structural Brackets? Can I Use Screws Instead of Nails for Framing? Can I Use Screws to Install Joist Hangers? The old saying screws for grip strength, nails for shear is a good recommendation. 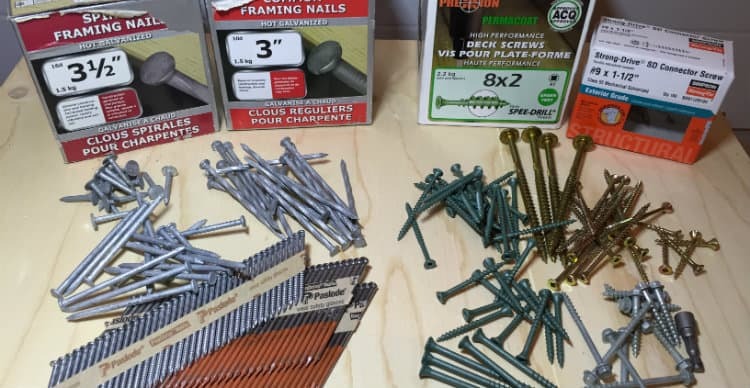 Use nails for framing and screws for finishing – sheathing and subfloor. Although screws can be used for framing, the Building Inspector may not agree – most building codes still identify 10d and 16d nails as the norm, not screws. When using nails or screws for construction, my preference is hot-dipped galvanized spiral nails, or ACQ rated deck screws. Less concern about rusting out, and they hammer or drive in easier. Also, spiral shank nails are easier to remove than ring shank nails when I make a mistake. Pro Note: Ensure nail diameter is equal to the common nail diameter for the length needed. The screw diameter is often greater than the typical nail diameter it is replacing. Use rated structural screws, not drywall or interior grade screws. Cost: nails are less expensive than equivalent screws, but collated nails may not be. Quicker to drive: with a good hammer and accurate swing, a 16d common hot-dipped galvanized spiral nail will sit flush with 3 good strikes. Greater shear strength: correctly sized nails will handle structural movement through bending or backing out. Whereas non-structural screws will more likely shear off. Meet Code: many building codes still recognize 10d common and 16d common nails as the only acceptable fasteners for building. Structural Engineers have recognized structural screws as acceptable. So the next code edition may include these screws. Nails bend easily: if your hammer swing isn’t accurate, or the nail encounters a knot, they’ll bend. Lack of space to swing the hammer or squeeze the power nailer in can also cause nails to bend. Impact vibration: striking the nail or firing it into the wood can cause studs or joists to jump or move out of alignment or square. Difficult to remove: we all make mistakes, or change plans as great ideas surface in the sweat of the moment, pulling out a well-set nail, or nails, is grunt work. Easier to remove: it’s a lot easier to remove a screw than a nail, and causes less damage than removing a nail. Structural screws exist: Simpson Strong-Tie screws and Torx #9 and #10 are recognized as structural screws. Other brands are working to have products recognized by Engineers as structural nails too. Placement accuracy: it’s much easier to be accurate with the placement of a screw than a nail; they don’t change direction if hit off center. Cam out: the torque of the driver and angle of drive can cause the bit to slip or cam out and strip the recessed screw head. Torx and Simpson drivers minimize this occurrence. More time to install: a power nailer is presently the fastest way to fasten material together, but a power driver vs a hammer is a more even match – much depends on the skill of the user. Wood splitting: screws are thicker than nails and may cause dry wood to split, or you may need a pilot hole for hardwood. Code breaker: out of date building codes require revising to recognize screws as structural fasteners. Pro Note: the quality of the fastener, whether screw or nail, depends on the manufacturer and the warranty of that manufacturer. There are a lot of cheap, poor quality fasteners out there. I’ve had screw heads break off while driving, and nails actually bend like an ‘S’ with a good strike. Good quality may be more expensive, but much less frustrating! Nails and screws are made from pieces of a metal rod that are pressed or squeezed to form their three different parts. Although similar, there are unique differences. The nail consists of the head, the shank, and the point. The larger often flattened part is the head which makes it easier to hit with a hammer. The long narrow part is the shank. The friction between the shank and the wood hold the pieces together. The point is the tip of the nail that enters the wood first. It is tapered to separate the wood fibers and make it easier for it to penetrate the wood. The screw consists of the head, the threads, shank diameter, root diameter, and the pitch. The cone-shaped (bulge), raised, or rounded/dome head of the screw has a sunken or depressed area that allows a tool, such as a screwdriver, to twist it. The threads on the narrower section are spiral ridges that create friction and grip to hold pieces together. The shank diameter is the smooth section between the head and the threads. The root diameter is the thinner shaft between the threads. The distance between the ridges or threads is the pitch. The pitch indicates the number of threads on the screw. The main differences between a nail and a screw are what they are designed to do. A nail is designed to hold things together and have a strong shear force. The shear force means sliding forces applied against the two pieces the nail is holding together. The screw has a powerful grip force due to its threads. The grip force is the force needed to pull the two pieces apart. Grip strength of the screw is based on the pitch, the number of threads. The greater the pitch, the greater its gripping power. A nail’s grip strength is based on the character of the shank. A smooth shank has less grip strength than a ring or spiral shank. Check it yourself. Hammer a nail halfway into a piece of wood, and screw a similar size screw halfway in next to it. Use the claws on your hammer to pull them out. Which comes out easier? The nail slides out, but the screw rips the wood when pulled out, and requires more force. This gripping force holds pieces together or pulls them together. Shear strength is determined by the diameter of the nail’s shank; the greater the diameter, the stronger the shear strength. The shear strength of a screw is based on the same principle. However, due to the twisting force applied when driving the screw, it can be more brittle than a nail. To see for yourself hammer another nail halfway into a piece of wood, and drive a screw in halfway too. Turn the board on its edge and hit the shaft of the nail, it bends sideways but stays held in the wood. Do the same to the screw and it either breaks or bends and is loose in the hole. This demonstrates the greater functional shear force of the nail as it stays tight in the hole. For example, a 16d box (nail gun) has a grip force of 33 pounds, while a comparable #8 screw has a grip force of 168 pounds! That 16d’s shear force is 95 pounds, and the #8 screw is slightly less at 90 pounds. The diameter of the 16d is 0.131″, and the #8 has a diameter of 0.164”. For comparable shear strength, a greater diameter is required for the screw. The copper (copper azole and alkaline copper) used in the treatment of pressure treated lumber causes a real problem when building. It is corrosive to untreated nails, screws, bolts, and structural brackets causing them to fail. Ensure you protect the brackets and use properly treated nails and screws that won’t corrode. Hot-dipped galvanized brackets, nails and screws are the recommended. Easier to drive into wood, and to remove. Work well with a hammer or nailer. They have good shear strength, but not much grip strength. Good for framing. More difficult to drive and to remove from wood. The wood fibers pop back into the channels between the rings to help hold it in place. However, once they break free of the holding fibers, they’re fairly easy to pull. Work well with a hammer, but require more pressure and PSI on a nailer to sink flush. Often used for plywood, roofing, siding, and underlay. A similar drive to ring shank, but more difficult to pull until almost out, so have a good grip force. They turn like a screw as they go into the wood. Work well with a hammer, or nailer. Great for most construction uses. Paper collation is more expensive than plastic or wire welded. Bits of paper go into the wood with the nail and don’t fly around the job site or make flags that prevent the nail from seating properly. This makes them safer to use, and they penetrate properly but need to be kept dry. Two thin wires are welded to the nails to keep them aligned. They handle the weather and job site abuse better than paper collated nails but can bend and cause the nailer to misfire or jam. Although good at any temperature, the wire does cause flagging which prevents the nail from seating properly. It also creates dangerous flying metal pieces. Different nailers require nails connected with paper, wire weld, or plastic to keep them correctly angled and spaced to feed. Available in a variety of nail lengths and finishes, including double hot-dipped galvanized with a smooth, spiral or ring shank. You can also get plastic collated nails. While cheaper, they are more easily damaged and cause more jamming, flags and flying plastic; so they may not be as great a savings. Common: a smooth shank bright steel nail with a round flat head; it has a larger diameter than a similar “d” box nail. Box: a coated smooth shank bright steel nail with a round flat head. Galvanized nails are made of steel or iron and have a coating of zinc. However, how thick the zinc is, and how it is melded to the metal determines how resistant it is to corrosion. Hot-Dipped Nails: certified hot-dipped galvanized nails resist ruts for a long time. Double dipped have a more uniform and thicker coating of zinc, so are more resistant to rust. Best for pressure treated material. Hot-Galvanized Nails: nails are tumbled with hot zinc chips that leave zinc on the metal they contact; coverage is spotty at best. ElectroGalvanized Nails: electricity is used to fuse the zinc in a thin layer to the metal. Very shiny, but will rust quickly. Pro Note: Only use a smooth-faced hammer as the milled face can damage the zinc coating and cause oxidation. Stainless Steel Nails: a more expensive nail. They are ideal for coastal watercraft, cedar or redwood, or buildings that contain highly corrosive products – like salt or fertilizer, or animal barns. Historically, nails have been identified by a number followed by the lower-case letter ‘d’; they are also sold by length. The ‘d’ is the abbreviation for the Roman “Denarius” which means penny. So a 16d or 16 penny nail is 3½” long. It’s believed that in old England 1000 hand forged nails 3½” long cost 16 pennies, a 1000 nails 1” long, or 2d, would cost 2 pennies by this explanation…thoughts for another article. The nail size is used by engineers and architects when they design buildings. It is used to meet code specifications, which are based on the wood connection strengths using a common nail. The names and sizes also allow different trades to determine what nail will work best for various tasks. The length and diameter of a nail determine its shear strength against lateral forces. The greater the diameter and length, the more wood contact, the stronger will be the connection. If a plan calls for a 16d common nail at 12-inch centers (16d’s @ 12” o.c.) for beam or header, then that is what should be used. The common nail is thicker than a box nail, so it creates a stronger shear strength connection. The shear strength of the 16d common is 30% greater than that of the 16d box nail, so size does matter. It is important to use the correct nail for the task. The most frequently used nails in construction are 16d, 10d, 8d and 6d. The label on the box usually is full of useful information. I’ll use 4 different labels examples to highlight what they tell you. Screws are more frequently used when grip strength is needed; you need to pull two boards together or prevent a piece from lifting or separating from another – for example deck boards to joists. As with nails, there are thousands of screws to choose from, but only some that will do the shed building task you have before you. Ceramic coated Screw – Deck Screw: Screws specifically designed and treated for use in ACQ (Alkaline Copper Quaternary) and other chemically treated lumber. Rugged Structural Screw (RSS): hardened steel fasteners that can be used instead of lag screws. High tensile torque with greater shear strength gives an RSS with a diameter of 5/16” the equivalent strength to a ½” lag screw. Good for treated lumber too. Galvanized With Zinc: hot-dipped screws should be G-185 coated (1.85oz of zinc/sqft of steel), good to use in pressure treated material and exterior use. ACQ rated. Stainless Fasteners: good screws for resisting corrosion and ACQ compliant, but expensive. Don’t use with galvanized connectors as the zinc will cause corrosion. Polymer-Protected: screws with a thin zinc layer covered with a plastic-like coating to protect it from moisture and dissolved copper. There are a variety of different recessed drive shapes on the market. The most commonly used are the slotted, the Phillips, the square or Robertson, and the Pozidriv. Slotted: The oldest style of drive and very common; unfortunately easy to strip (or cam out) the drive if using high torque. Phillips: The recessed “X” or cross-improved the torque application, but it is still easy to slip and strip if using a high-speed driver. Square: The more deeply recessed square drive has become more common as it more difficult to strip; the screw can also fit on the drive more securely so good for hard to reach spots and one hand driving. Phillips/Square (Quadrex): A combination drive head that works independently with a Phillips or square driver, or a combination driver. Improved high torque drive capability means less chance of stripping the drive head with the combination driver. Star (Torx): A recessed six-pointed star improves the drive torque capability. Ideal for torque drive. Polydrive: More common in Europe, it has the crosshead of the Phillips with 4 extra smaller slots for extra drive grip. Screws are usually labeled by the gauge or diameter of the smooth shank between the head and the tread; so #8 would be 8 gauge or 5/32” or 0.164” in diameter. The bigger the number, the larger the head and shaft diameter, but not the length. Many non-imported boxes of screws now actually list the shear and grip strength on the label – more expensive but better quality. Screws are sized by gauge and length, so a “#6×2” means a 6-gauge screw that is 2-inches long. Sometimes screws will also be labeled with the gauge, pitch, and length – “#6-12×2” would have 12 threads per inch and be 2-inches long. The pitch for wood screws is fairly standardized. It refers to the threads per inch and is often known as Type AB screws. However, some have a faster or steeper pitch and are referred to as fast threads or Type A screws; they have fewer threads per inch. Three common screw sizes for use in shed construction are below. I’ve identified the stardrive, but it could be any of the available drive styles. A flat-head means it will sit flush and wood deck screw means it is ACQ rated. Most 2-inch long screws have an initial diameter of 0.164”, but an average diameter of 0.112”. The equivalent 6d common nail has a diameter of 0.113”. A good screw for attaching sheathing to walls and subfloors to joists. 3-inch long screws commonly have an initial diameter of 0.177”, and an average diameter of 0.122”. The equivalent 10d common nail has a diameter of 0.148”. A good screw for framing, truss construction, and overlapping or doubling joists and studs. 3½-inch long screws usually have an initial diameter of 0.190”, and an average of 0.130”. The equivalent 16d common nail has a diameter of 0.162”. Can be used for headers and beams. The “T-25” identifies the drive type as a Torx or star head and the size of the driver that will fit is 25. There are T-1 through T-100 available. Coated screws mean ACQ rated, and the screw length is 3-inches. 9 ga. is the shank diameter, so 0.177”; equivalent to a 10d common nail. It’s a 5 pound box containing 309 screws…approximately. This manufacturer also includes a drive bit. I tend to use longer nails than the code may typically require – I usually have 10d and 16d common spiral (ardox) hot-dipped galvanized nails in my tool belt when building sheds. If the nails could get wet or damp, use galvanized. Joist Hangers – Can I use roofing nails for joist hangers? Can I use screws? If using joist hangers there should be 6 -10d common nails connecting the hanger to the plate or band board. An additional 4 – 10d common nails should be driven diagonally through the hanger and joist into the plate/band board. Make sure your 10d common nails are 3-inches long; otherwise their bearing ability is compromised. Although there are some products that state they are a construction connector or joist hanger screw, most codes don’t recognize screws due to the lower shear force rating. Simpson Strong-Tie does produce a structural hex-head fastener that is recommended for some of their brackets, but not all. If someone is going to stand on it, stay safe and us 3-inch 10d common nails. For outdoor or pressure treated wood, only use joist hangers with the letter “Z” at the end of their model number. Never use roofing nails for joist hangers! The head can actually separate from the shank when driving into the wood through the hanger. Cedar – 316 stainless steel ring shank 1¼” nails manufactured for cedar shingles and shakes. They’re expensive, but then you chose cedar shingles. Simpson Strong-Tie fasteners are designed for many different construction applications. They are widely available and backed by a guarantee – provided the manufacturer’s instructions for use and installation are followed. An 18-gauge zinc galvanized bracket for securing rafters or trusses to walls. An 18 gauge galvanized twist strap like bracket for connecting rafters or joists to a wall, or a joist to a beam. An 18 gauge galvanized 2×8 double shear design joist hanger for deck or floor joists. Use 16d hot-dipped galvanized nails. Simpson Strong-Tie strong-drive hex-head SD9212 and SD9112 SDS screws. HGQA are galvanized double or triple joist hangers. Use 16d hot-dipped galvanized nails or Simpson Strong-Tie strong-drive 3” SDS screws. 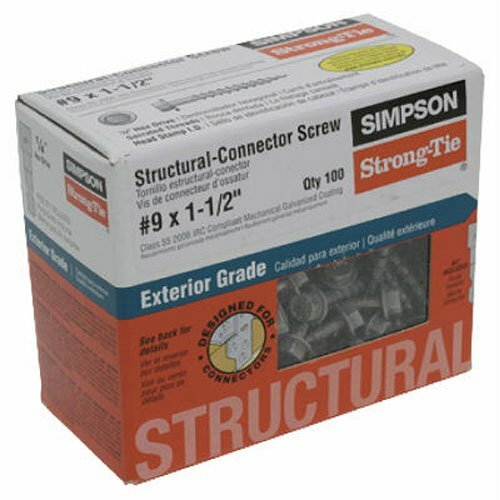 Simpson Structural Screws SD9112R100 No.9 by 1-1/2-Inch Structural-Connector Screw can be used with most Simpson Strong-tie structural brackets. Screws can be used for framing if they are designed for structural purposes are the same length and are equivalent diameter or greater than the nails they are replacing. To install joist hangers you can use Simpson strong-drive hex-head 3” SDS screws or strong-drive hex-head SD9212 and SD9112 SDS screws. They meet the manufacturer’s recommendations and are code compliant. It is not recommended that you use deck screws and you should never use roofing nails. If the joists are supported by beams or plates, then end nailing to the rim or band-board makes sense. If the rim board or plates are holding up the joists, then use joist hangers. They’ll support more and are better secured with 6 to 14 nails!